Siberian Huskies are not only very intelligent, very loyal and very good looking they are also very athletic. That means that they not only require lots of exercise but lots of general playtime as well. 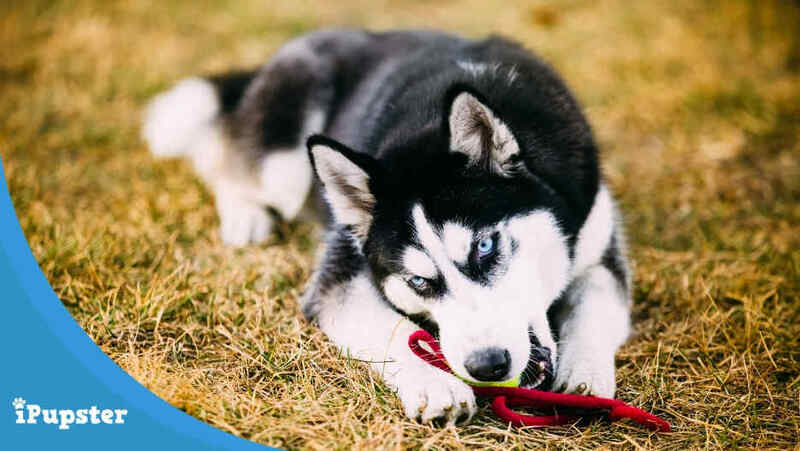 Huskies need toys that addresses their need for both mental and physical stimulation, but how can you choose when there are so many available to choose from? With all of this in mind here is a look at seven of the best toys for Huskies. Always supervise your Husky when he gets a new dog toy. Do you have a KONG or two in your toy bucket? I do! KONG remains one of my favorite go-to toys for my boys. The KONG Jumbler Ball is a toy that ticks all of the boxes when it comes to a great dog toy for Siberian Huskies. Not only is it a great toy for long sessions of fetch but also a puzzle toy that stimulates your pup's intelligence. Essentially the Jumbler is two balls in one. The larger, hard plastic ball is uniquely shaped with a special handle that is easy for even large dogs - like the Siberian Husky - to grip and hold - but it contains a second tennis ball, and a squeaker - that creates an exciting interactive element that most pups love. The durable construction of the outer ball means it stands up to aggressive chewing very well - some reviewers report that their fur kid has 'owned' the same KONG Jumbler for longer than any other toy - and the bright colored outer ball means that the toy is easy to find is a game of fetch sees the ball thrown out of sight. We love how durable this toy is, the fact that it amuses even the most inquisitive pup for hours and that the special handle means that pups can fetch, carry and even play tug of war with their pet parent, making for exciting and varied playtimes of the kind that any Siberian Husky would enjoy. The KONG Jump'N Jack Dog Toy is another example of a great 'fetch' play toy that is especially good for larger, active dogs like the Siberian Husky. 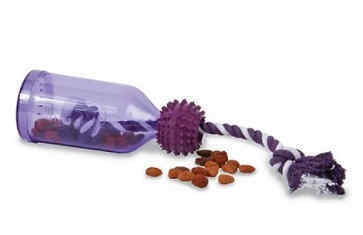 And not only does it provide hours of fun at playtime but it also helps improve your pup's dental health. The uniquely shaped toy - which is crafted from a very durable rubber that reviewers said stands up to even very aggressive chewers, which many Siberian Huskies are - features a series of chewable 'branches' that form a rough ball shape but are easy for pups to grip, chew on and carry. It also makes it very easy for pet parents to throw for their energetic pup to retrieve. The other advantage of those sturdy rubber branches? The fact that they are ridged, so that as your pup chews those ridges gently clean his teeth and even help remove food that may be lodged in his teeth. We like to add little treats along the ridges and use the irresistible Kong peanut butter spray on top of his treats. As dog dental health is very important - but cleaning a husky's teeth can be quite a challenge - this is another real plus this clever dog toy has to offer. But even that is not all, as the toy can be stuffed with treats for your pup to discover and release by tipping the toy in just the right way. 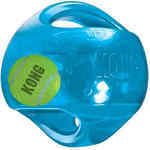 I love the KONG Jump'N Jack because it is so versatile and seems to amuse dogs for hours at a time. It's durable and it does a great job at removing plaque from a dog’s teeth during playtime. And this is a toy that really lasts, as many pet parents report that their dog's Jump'N Jack has lasted for up to seven years! We highly recommend this interactive food toy for your Husky! Many dogs - even big dogs like the Husky - love to have a 'cuddly' soft toy available, as a cuddle buddy in his dog bed and a source of interactive entertainment. One of the problems, when it comes to a bigger dog who loves to chew, is that these toys often do not last too long and quickly, sometimes within hours, become nothing more than a pile of stuffing and ripped fabric. As the Crazy Critters Raccoon is a stuffing free toy that messy element is eliminated and it is crafted from a durable, flexible non toxic fabric that many of those who have purchased the toy report stands up to their aggressive chewer very well. The toy 'crinkles' when chewed and when bitten in just the right spot will squeak as well, adding yet another element of fun. The most frequent positive comment about this toy from pet parents is how durable it is. Many that have previously struggled to find a cuddle squeak toy that would last for more than a few days say they have found one in the Crazy Critters Raccoon. Since Huskies are an incredibly intelligent breed most will love a dog toy that presents them with a mental challenge. The Busy Buddy Twist 'n Treat does just that. When fully closed the Busy Buddy Twist 'n Treat resembles a standard - but very brightly colored and durable, rubber ball, the kind that is great for a game of fetch or even a game of soccer, something that an active pup like a Siberian Husky will often really enjoy. Look a little closer though and you'll find that they ball can be twisted apart and treats added. The opening can be adjusted to control 'the flow' of the treats - so that they will be dispensed randomly as your pup bats, chews and paws the ball around. We love the fact that the natural rubber is very durable and resists damage even when aggressively chewed on. It does provide something of a challenge and even when dogs think they have 'figure it out' the twist opening can be altered to create a brand new challenge for them to figure out all over again. Perhaps the name gives it away; this ball looks just like the full moon, especially when it glows in the dark. Crafted from a tough but pup safe rugged natural rubber it is softer than many of the other dog balls designed for aggressive chewers and has a surprisingly good bounce, making it the perfect choice for both a good game of doggie soccer and an active game of fetch or catch. The ball is water resistant, so it can also be used as a water toy, either in the pool or out at the lake, making it a great choice for athletic pups who like to indulge in watersports. that will be released slowly when they move the ball in just the right way. Fans of this doggie ball comment most often on just how durable it is. Many report that while other 'tough' dog balls have lasted just a few days this one has survived their 'aggressive chewer' for months. Pet parents also appreciate the fact that the softer rubber is quieter when played with indoors - some hard rubber balls can indeed be very noisy - and that the challenge presented when treats are added is one that keeps their pups engaged for hours. The Starmark Treat Dispensing Chew Ball Dog Toy is another great choice for Husky pet parents who are looking for a mentally stimulating dog toy that lasts. The ball - which is available in several different bright and engaging neon colors - is designed to be durable but not too tough on a pup's teeth if they choose to chew it. In fact despite the fact that many pet parents state in online reviews that the Starmark Treat Dispensing Chew Ball Dog Toy is the longest lasting ball toy their pup has ever owned it is still quite soft and has a nice bouncy feel when used in a game of fetch. As the name suggests this is a treat dispensing ball, something that many experts recommend be given to inquisitive, active dogs like the Siberian Husky. Treats of several different sizes can be added to the ball and that will vary the rate at which they are dispensed. The larger the treat, the longer the playtime and some pet parents report that when a larger kibble is used the ball can keep their pup amused for hours. One look at this clever dog toy tells pet parents that it offers a different kind of challenge - and playtime - for an intelligent pup and in practice it lives up to that visual promise according to many of the satisfied customer reviews online. The toy is essentially a large, durable rubber jug that can be filled with treats - treats that your pup can see, thanks to the jug's transparent construction. It is then topped with a nubbed ball at the mouth of the jar attached to a durable pull rope. When your pup pull the rope in just the right way treats are released, and they can chew on the ball to if they chose to, something that actually helps to clean their teeth. Here's Hoshi, a Pomchi demonstrating how much fun and challenge the Busy Buddy Tug-a-Jug Treat Dispensing Dog Toy is. There is one more element to this toy that pet parents praise a great deal; it offers them a great way to interact with their pup in a new way, especially via the tough tug rope. many were surprised by how durable the toy was too. As every Siberian Husky pet parent is more than aware their fur kid is an active, intelligent pup who craves, and needs, both mental and physical stimulation from their toys and the fact that most of these large dogs are also rather aggressive chewers means that these toys have to be very durable as well. The best toys for Huskies are those that offer a real challenge, which means a puzzle toy with adjustable levels of difficulty - which is the case for many of the toys on this list - will always be a good choice and if it also features interesting sounds and/or textures that can be another big plus. Also Read: Siberian Huskies Diet: Which is the Best Food To Feed, Raw or Dry Kibble? What Toys Should Not Be Given to a Siberian Husky? Perhaps above all else any toy you give your Siberian Husky needs to be as durable as possible. Flimsy toys, that are broken or chewed through quickly not only waste your hard earned money but can sometimes pose a choking hazard for your pup as well. For your growing Husky pup, the best puppy toys for chewing should be made of soft rubber since these would be gentle on your dog’s sore gums. 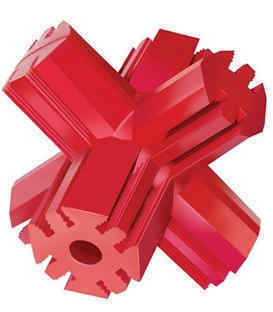 A standard chew toy, even a durable one, will also not pose quite enough of a challenge for an intelligent pup like a Siberian Husky to remain engaged enough to play with it for any long period of time so dog toys that are very passive may end up being little more than a waste of money as well.